Sun, Sea and…Steep! – Run. Ride. Roam. What a glorious morning! What a sparkling day! What a corker! 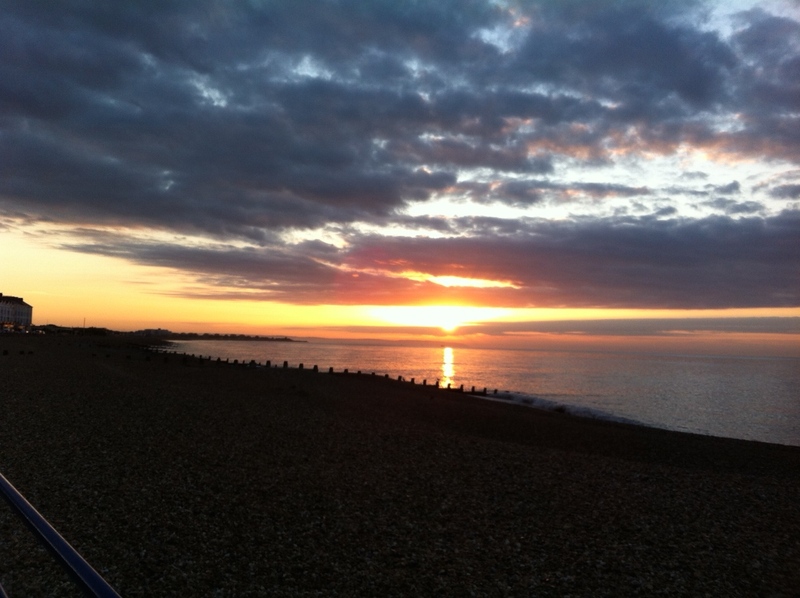 Off I went for another early morning run of 12km along the seafront at Eastbourne. The sunrise was beautiful and I ran by the water, listening to the harmonies of the crashing waves and the cawing of the gulls. I ran in one direction, with the rising sun before me, then when I ran out of promenade, turned around and ran towards the spectacular white cliffs of Beachy Head. It was a terrific run at a gorgeous time of day. I told him where we’d been and that we were almost at the end of our stay in England and would be returning to mainland Europe soon. “Remember to ride on the other side of the road,” he said. “Yes!” I replied, because we had indeed forgotten on occasion during our first stint in Europe. “You wear a watch?” he asked, glancing at the watch on my left wrist. “What a great idea!” I said, “that’s a fantastic tip!” It sure was, what a simple idea to have a constant visual reminder of the side of the road to ride or drive on. Watch on the left wrist when riding on the left side of the road, watch on the right wrist to remember to ride on the right side of the road. Brilliant! After getting some errands done in town, we set off along the coast. The sun shone magnificently, it was warm and we were able to ride in t-shirts again. Fantabulous! We were on a cycle path most of the way, following Route 21, before picking up Route 2. We did have some road riding to do, but for the most part we hugged the coast, riding on fantastic, flat, sealed cycle paths. It was so nice to have the ocean beside us, with the wind at our backs, the sun beating down and the water twinkling in the distance. Magic. Our lunch yesterday had been so scrumptious, that before leaving Eastbourne we had called into Oh My Goodness again to pick up some lunch for the road. 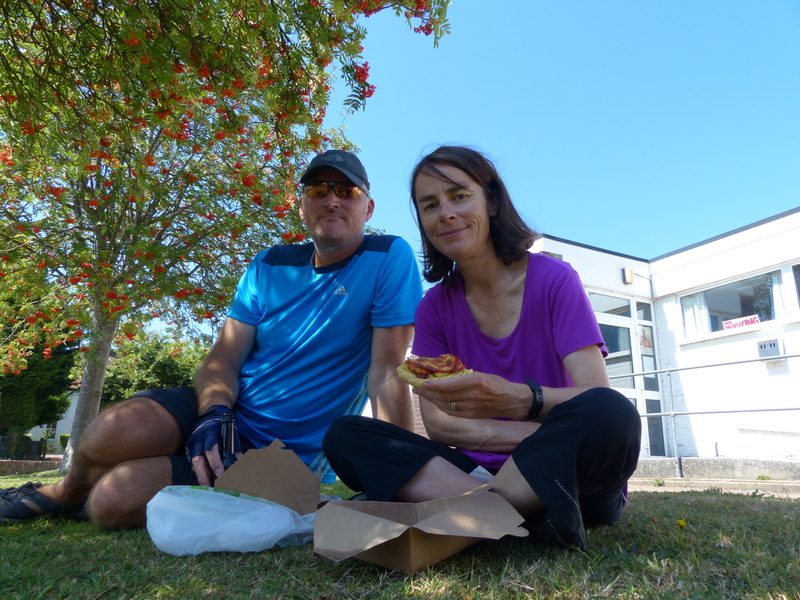 Riding into the town of Pevensey, we passed a bench beside a small park and stopped to tuck into our vegan feast. A Cornish pastie each, a piece of banana and caramel cake for me and a piece of chocolate mint cake and a bottle of ginger beer for Steve. It was a hearty and DEE-LISH-US lunch, and we ate it sitting in the sun and mottled shade of a tree. Perfect. On we went, with some road riding along a narrow country road, with the ocean in the distance. We rode alongside pebble beaches, with motorhomes lining the edge and people sitting on deck chairs. 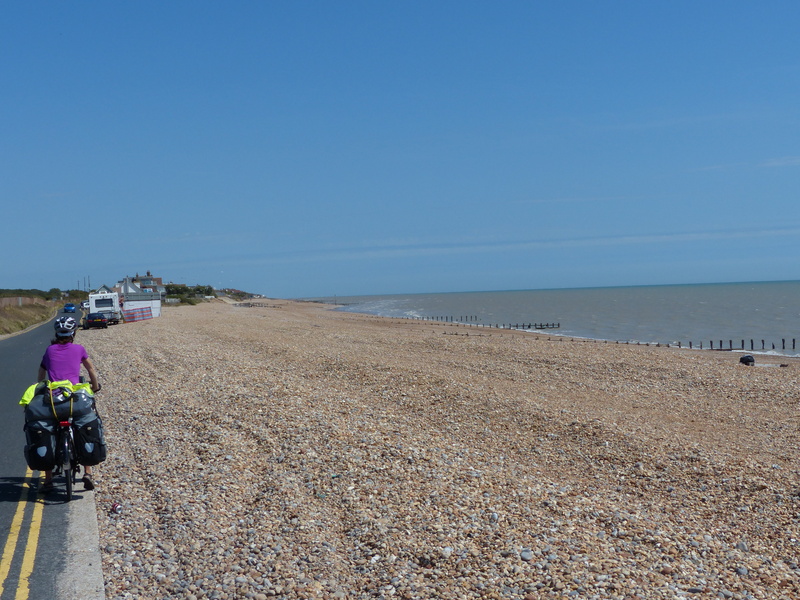 Then we entered Bexhill-on-Sea, which looked a bit like the Costa del Sussex! There were people everywhere, of all shapes, ages and sizes, showing varying expanses of white wobbly flesh, pink tinged by the sun or reddened like a lobster fresh from the pot. Everyone was happily grilling themselves on the beach or benches, with chests, faces and stomaches spread heavenward to the glorious solar miracle that had appeared before them today. Skimpy clothing was the fashion of choice for the young, confidently doing the “cellulite strut” down the boardwalk. The older folks chose to stick to their sensible but seasonally appropriate gaberdine shorts and bucket hats. No matter the age, shape or size of the people though, everyone was tucking into ice creams and the vendors were doing a roaring trade. Tongues were flicking this way and that in a hurried and vain attempt to beat the inevitable melt down the wrist of their vanilla swirl. The sun invariably won and no amount of licking and twisting of those cones was going to stop that glorious heat from turning their precious mountain of dairy, into a flowing stream over fingers and wrists. Everyone was having a marvellous time! We left the basking beach-goers behind us and continued along the coast, still with the sun above us and the sea beside us. Magnificent. 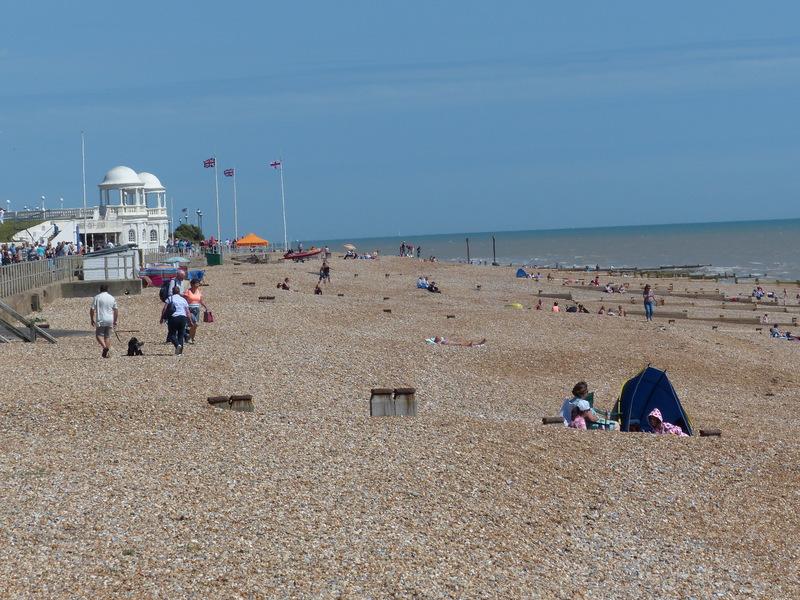 St. Leonards-on-Sea, on the outskirts of Hastings was another bustling place. We passed through and rode on into Hastings. This was our destination for the day. It’s Old Town Carnival Week in Hastings, so we thought we’d stop by and join in the festivities for the weekend. Being the location of the TV series Foyle’s War, we were both keen to join the Foyle’s Walk on offer tomorrow, a guided tour of some of the locations from the series. We stopped in town to pick up our tickets and then set off to ride the last few kilometres to our campsite. It was at this point, our lovely flat riding stopped. It stopped in a big way. 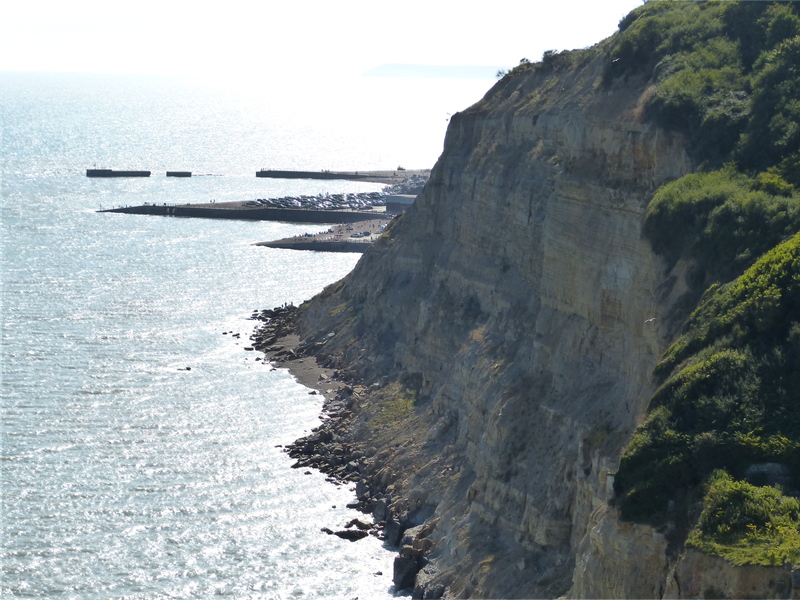 There’s a high cliff that sits above Hastings and guess where our campsite was located? Off we went, cranking down the gears, puffing and sweating in the heat, as we climbed those steep, steep streets, up…up…up, high above the town. When we were part way up, I noticed a little boy in the front yard of his house. “That’s a steep hill,” he said as I rode past. “Yes mate, it is!” I replied. “Where you goin’ up that hill?” he enquired. “To the campsite,” I replied. “Oooh, that’s a steep hill!” he remarked again. “Yes it is,” I laughed. Now you may have some idea at this point of the remarkable lack of speed with which I was climbing this enormous hill. I was able to have this conversation with the little fella, all in the space of passing his front yard. My pace up the hill was at the perfect conversational pace, no hurry, enough time to crawl past and have a chat. I wasn’t whizzing by, I was racing snails up that hill, so there was ample time for all those spoken words! After much huffing and puffing and only one rest stop, we eventually made it to the top and to our campsite after 39km of riding. It’s a touring park, which we usually try and avoid, but didn’t have much choice this time. So we are in a very busy, noisy and bustling place, but have found a pitch nestled into some trees. We have all the activity and loud voices and loud music all around us, but we are settled in our little tent. Steve has just turned to me though, after hearing the loud arguments being had by some new arrivals as to where they were going to park and camp. “I don’t like touring parks,” came Steve’s words. Nope, they sure aren’t the peaceful paddocks we prefer! Our campsite is way up here! 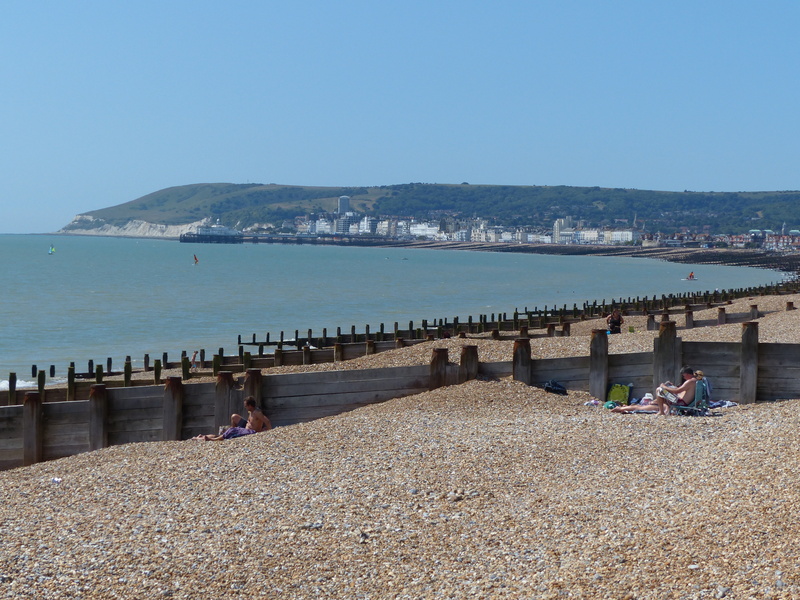 We attempted a walk back down into Hastings, through a Country Park we had been directed to. After walking down a steep track, we found the path was closed due to rockfalls, so we had to turn around and walk back up the steep track. We could have taken to the road and started again, but gave up and headed to the campsite bar for a cold drink instead. With nowhere close by to get supplies, and a late return hike back up the hill, being a requirement if we headed into town again, we instead settled for a can of baked beans and a can of spaghetti that we were able to find in the camp shop. Simple and basic, but it did the job to fill our bellies. 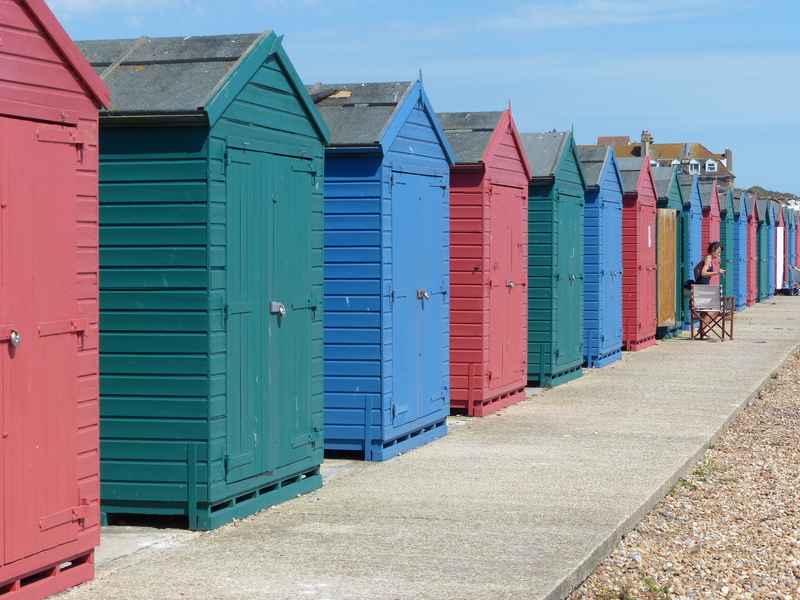 Tomorrow we’ll explore Hastings, see what it has to offer, roam The Old Town and join in the final days of Carnival Week. I hope the sun keeps shining, because what a difference it makes! It was a glorious, sparkling, twinkling day today and it was just the day we’ve been wanting. Super dooper! Come on darling England, you can do it! Patterns are there to be broken! Give us a day like this again tomorrow. Two days in a row of magic sun and warmth. It really does show your best side you know my darlin’. Some sun and you just shine. So if you don’t do it for us, do it for that glorious glow that you have, when you wear the solar bling. You can do it, strut your stuff…give us some sparkle!